A Qunique Workout Program For The Plus-Size Woman"
author of "Real Fitness For Real Women: A Unique Program For The Plus Size Woman" is the president and creative energy behind of In Fitness & In Health, New York's premier facility designed exclusively for the wellness and wholeness of plus-size women. 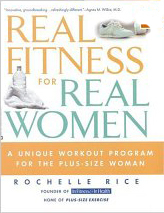 Rochelle is also the author of Real Fitness for Real Women (Warner, 2001). In researching fitness programs for women of size, it became evident that there was a lack of program design and availability of certified trainers specializing in larger women. With her history of bulimia, Rochelle's interest in Plus-Size Exercise came through her concerns about the inordinate stress put on thinness in our society, rather than fitness. Providing a safe environment where women could exercise physically while feeling secure emotionally, became Rice's passion. Designing a fitness technique where women of size could achieve a level fitness was the base of her graduate work. Rochelle believes that movement is the catalyst for health. Movement creates momentum. By softening and listening to the body, curiosity is created. The curiosity releases energy and the energy allows one to move toward her goals. With a holistic approach toward weight, Rochelle's work focuses on the whole woman by creating possibilities based on innate individual strengths and teaching skills and tools to support and build those strengths - Focusing on the strengths that already exist and create a stronger union of the body and mind which she calls "grace." size eight or ten would be to fight a difficult and losing battle. without pushing yourself too far and without depriving yourself. Through my program, you can learn how. society's dysfunctional relationship to food. important. You should create an eating lifestyle that works for you. you; inspiring you to action. dieting! So what tip can I offer you? Begin sitting at the table with the food plate in front of you. 1. Inhale through the nose. 2. Exhale through the nose. 4. Place the fork down. 7. Repeat 1 - 6.
numbness, and inactivity becomes the norm. But that habit of inactivity can be reversed through self-esteem. sense of well-being and joy.